1. Soak Rice and Urad dhal separately for 2 hours. 2. Soak Ragi flour for 30 minutes. 4. Drain the water that stands above the ragi flour. 5. Now mix ground rice, urad dhal, ragi flour and salt. 6. Allow it it to ferment for atleast 8 hours before use. 7. Make idlies and serve hot with garlic chutney. Thanks for the entry Nithya. 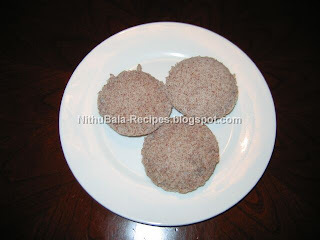 I'm seeing a lot of ragi idli recipes and wondering why I haven't tried it all these days. i tried it today,it was reallly nice,thanks for the healthy and nutritious recipe.